This lesson plan was developed by the Robert F. Kennedy Human Rights. It has been slightly modified to reflect Canadian education context and values. Malala Yousafzai is a student and education activist from the town of Mingora in the Swat District of Pakistan’s northwestern Khyber Pakhtunkhwa Province. She is known for her activism for rights to education and for women, especially in the Swat Valley, where the Taliban have been known to ban girls from attending school. In early 2009, from the ages of 11–12, Malala wrote a blog under a pseudonym for the British Broadcasting Corporation (BBC) detailing her life under Taliban rule, their attempts to take control of the valley, and her views on promoting education for girls in the Swat Valley. The following summer, a New York Times documentary was made about her life as the Pakistani military intervened in the region, culminating in the Second Battle of Swat. Malala rose in prominence, giving interviews in print and on television, and was nominated for the International Children’s Peace Prize by South African activist and Speak Truth to Power human rights defender Desmond Tutu. In October of 2012, the Taliban’s attempt to assassinate Malala left her in critical condition, sparking a national and international outpouring of support. The United Nations Special Envoy for Global Education, Gordon Brown, launched a petition in her name, using the slogan "I am Malala", demanding that all children worldwide be in school by the end of 2015 – a petition which helped lead to the ratification of Pakistan’s first Right to Education Bill. Malala was the winner of Pakistan’s first National Youth Peace Prize. On July 12, 2013, to celebrate her 16th birthday and Malala Day, a day declared by UN officials, Malala gave her first public speech since the shooting, highlighting the necessity of universal education at the United Nations Headquarters in New York. Malala was awarded the Nobel Peace Prize on December 10, 2014, for her struggle against the suppression of children and young people, and for the right of all children to education. “In the name of God, The Most Beneficent, The Most Merciful. Honourable UN Secretary General Mr. Ban Ki-moon, Respected President General Assembly Vuk Jeremic, Honourable UN envoy for Global education Mr. Gordon Brown, Respected elders and my dear brothers and sisters; Today, it is an honour for me to be speaking again after a long time. Being here with such honourable people is a great moment in my life. I don’t know where to begin my speech. I don’t know what people would be expecting me to say. But first of all, thank you to God for whom we all are equal and thank you to every person who has prayed for my fast recovery and a new life. I cannot believe how much love people have shown me. I have received thousands of good wish cards and gifts from all over the world. Thank you to all of them. Thank you to the children whose innocent words encouraged me. Thank you to my elders whose prayers strengthened me. I would like to thank my nurses, doctors and all of the staff of the hospitals in Pakistan and the UK and the UAE government who have helped me get better and recover my strength. I fully support Mr. Ban Ki-moon the Secretary-General in his Global Education First Initiative and the work of the UN Special Envoy Mr. Gordon Brown. And I thank them both for the leadership they continue to give. They continue to inspire all of us to action. I remember that there was a boy in our school who was asked by a journalist, "Why are the Taliban against education?" He answered very simply. By pointing to his book he said, "A Talib doesn’t know what is written inside this book." They think that God is a tiny, little conservative being who would send girls to the hell just because of going to school. Dear fellows, today I am focusing on women’s rights and girls’ education because they are suffering the most. There was a time when women social activists asked men to stand up for their rights. But, this time, we will do it by ourselves. I am not telling men to step away from speaking for women’s rights rather I am focusing on women to be independent to fight for themselves. Dear sisters and brothers, now it’s time to speak up. So today, we call upon the world leaders to change their strategic policies in favour of peace and prosperity. We call upon the world leaders that all the peace deals must protect women and children’s rights. A deal that goes against the dignity of women and their rights is unacceptable. We call upon all governments to ensure free compulsory education for every child all over the world. We call upon all governments to fight against terrorism and violence, to protect children from brutality and harm. We call upon the developed nations to support the expansion of educational opportunities for girls in the developing world. We call upon all communities to be tolerant – to reject prejudice based on cast, creed, sect, religion or gender. To ensure freedom and equality for women so that they can flourish. We cannot all succeed when half of us are held back. We call upon our sisters around the world to be brave – to embrace the strength within themselves and realise their full potential. Dear brothers and sisters, we want schools and education for every child’s bright future. We will continue our journey to our destination of peace and education for everyone. No one can stop us. We will speak for our rights and we will bring change through our voice. We must believe in the power and the strength of our words. Our words can change the world. Because we are all together, united for the cause of education. And if we want to achieve our goal, then let us empower ourselves with the weapon of knowledge and let us shield ourselves with unity and togetherness. What are the obstacles that have an impact on girls’ education and barriers that keep girls from attending school? What can be done to lessen these barriers? What is the impact of a girls’ education on a family/community? How has Malala used her voice to stand up for her rights and the rights of others? Discuss the importance of education and the importance of equal access to education. Identify the reasons that girls face barriers and discrimination in educational access. Describe the impact of a girl’s education on the global community. Discuss ways they can speak for others in the same way as Malala. Identify future career or college interests. List the education needed to achieve their future goals. Have students come back together as a group and ask one member from each group to list the answers. Be sure to stress that, even if a student is not college-bound, there is a necessity for a high school diploma in today’s society. Ask students what would have happened if they were never able to attend school, if they were unable to read or write? What if they were forced to leave school after elementary school? How would their ability to achieve their goals have changed? Education leads to more concern about the environment. Hang eight sheets of blank poster paper around the room highlighting each of the eight areas. Have students walk around to brainstorm how education can impact each of the areas. Follow-up by providing statistics to support what students wrote and to enhance the classroom discussion. Show the video from the World’s Largest Lesson on the Global Goals for Sustainable Development 2030. Discuss the video, and in particular Goal # 4 on Education. Tie the discussion to one’s hopes and dreams. You can access a number of lesson plans on Goal # 4. Remind students about the previous discussion about girls’ education. 32 million primary-aged girls are still out of school around the world. 98 million more girls are missing out on secondary education. In total more than 130 million girls are out of school today. Tell students there is a young human rights defender who is trying to change those statistics. Show the ABC or CNN interview with Malala. Either show the video of Malala’s address to the House of Commons on the day she received her honorary Canadian citizenship, or have the students read the transcript. Discuss their reactions to her speech. Malala talks about many different concepts. What are they? Ask the students to spend some time journaling about how she expresses these concepts in her speech (students may need to have the transcript next to them for this activity). Have students either discuss or write about how she connects her philosophy with that of great peacemakers and advocates of non-violence. Since the creation of the Universal Declaration of Human Rights (UDHR) by the United Nations (UN) in 1948, many other international documents – also called treaties, covenants or conventions – have been drafted to develop these rights further. Countries commit to protect the rights recognized in these treaties by ‘ratifying’ them and sometimes a specific institution is created within the UN to monitor their compliance. Review Malala’s speech on her becoming an Honorary Canadian Citizen. “I used to think I had to wait to be an adult to lead. But I’ve learned that even a child’s voice can be heard around the world. Young women of Canada, step forward and raise your voices. The next time I visit, I hope I see more of you filling these seats in Parliament. What does it mean to be an advocate or defender? How does Malala exemplify what it means to be a defender? How can you raise your voice for those without a voice? What can you do to become a defender? Have the students form Action Groups of 3-5 members. Ask each Action Group to identify a school, community, national and international issue they feel passionate about. Have each group write their issues on flip chart paper under the different headings: School, Community, National, International. Have each group select one issue they will work on over the course of a specific time period leading up to a School-Wide Day of Action. What is the end goal? Do you want to educate your community about an issue? Do you want to change a law or policy? Do you want to publicly support a human rights defender like Malala? Who do you need to work with or influence to help you achieve your goal? A politician, journalist, other students, community members, school administrators? How can you reach that person or those people? What materials or resources will you need to take action? The Malala Fund, An organization dedicated to empowering girls through education. Yousafzai, Malala and Lamb, Christina. I Am Malala: The Girl Who Stood up for Education and Was Shot by the Taliban. Little, Brown and Company. N.Y. 2013. Washington Post Review, A review of Malala’s autobiography. October 11, 2013. 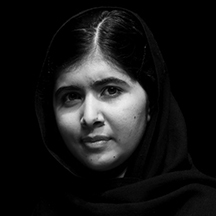 I Am Malala – A resource guide for educators, George Washington University. “Diary of a Pakistani Schoolgirl”. The writings that first got Malala national and international attention. January 19, 2009. “A Heroic Return”. An article about Malala’s return to school after being attacked. TIME for kids. March 20, 2013. Shining Hope for Communities. An organization transforming the face of urban poverty in Kenya through free education. Mind the Gap – Gender and Education. UN Global First Education Initiative. A five-year initiative to accelerate progress towards the Education for All goals and the education related Millennium Development goals. Malala’s Nobel Peace Prize Lecture. Given December 10, 2014 at the Oslo City Hall, Norway. Learn more about United Nations human rights mechanisms, including the treaty bodies established to monitor State Parties’ compliance with the core international human rights treaties and the Special Procedures of the Human Rights Council.